In order for your organization to operate at its best, the people within must be empowered. The team must feel confident working together and it must believe in the process. But believing in the process begins with the leadership, which is why you must empower yourself before you can empower others. 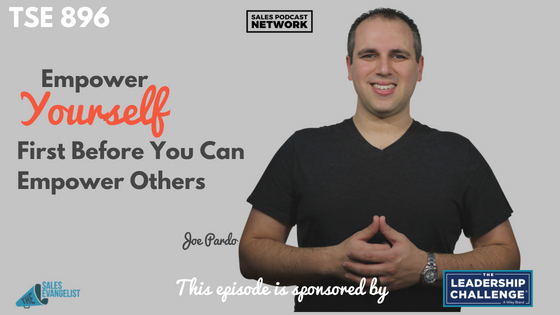 On today’s episode of The Sales Evangelist, Joe Pardo, who is an accomplished business coach, consultant, speaker, podcaster, author and DJ, shares his experience working in his family business, and his thoughts on learning to empower yourself first before you can empower others. 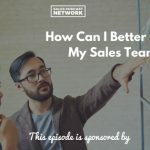 His newest book, Sales Won’t Save Your Business: Focus on the T.O.P., addresses the importance of developing confidence in your team, your customer, and yourself on the way to increasing profit. Joe believes that processes are the cornerstone of every business. They affect how your team operates, how you structure offers, and how your customers see you. It’s the concept behind his new book, because you may land a deal, but if your customer has a bad experience, he won’t be back. He’ll tell others how horrible the experience was and your business won’t be in a good place. Organizations that find themselves with frequent turnover, which results in constantly training new people, should immediately look to their processes. Consistency makes a difference for your client base. You need a system that makes people want to come into work. Sometimes negativity seeps into an organization. Even if it doesn’t exist within the leadership, negativity within a team can become visible to your customers. Before you can help your team, you have to figure out what makes you tick. You have to be able to remind yourself of the “magic” that keeps you doing what you do. During a period when Joe was working for his family business, his team was resistant to an upcoming structure change. He wasn’t really “in charge” of anyone, so he wasn’t empowered to fire anyone. He immediately understood the danger of publicly second-guessing those in leadership above you, because it forces the team to choose sides. As a result, he understood the importance of hiring the right people to start with, so that no one second-guesses each other. Leaders who understand people’s “why” will be better equipped to create a place people want to be. If you communicate to your people that you care about them and about their goals, they will buy into the mission and they will grow. They will want to help your company and they’ll be open to your guidance. What do your team members have on their walls? What kind of books are on their bookshelves? If you’re willing to take time to learn a little bit about the things they are interested in, it will carry you so far with your team members. Your goal is to create as many touch points as possible so you can relate things back to them. If one of your team members has interest in writing a book, put him in contact with a friend who has walked through the process before. Give away baseball tickets that your vendor gave you to a team member who loves baseball. If you’re in a leadership position, or you want to be, get used to creating processes for yourself and your team. Processes don’t have to eliminate spontaneity; they simply ensure that certain things happen within a certain time period. You might, for example, ensure that new employees spend time with veterans of the company. It allows them to see the opportunity available within the organization. Consider simple ideas like creating a budget that allows you to buy a breakfast sandwich for your team members as a way to build community with them. Make a point to get to know people personally. Your team members will feel a loyalty if you tap into their personal lives. Processes can be passed on to the next person when you move on to something else. 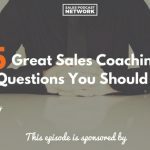 You can connect with Super Joe Pardo at his website, where you can also find a copy of his book, Sales Won’t Save Your Business: Focus on the T.O.P. Our friends at Wiley have provided a free excerpt of the book Stop Selling & Start Leading. Based on research and interviews with buyers, the book provides a blueprint for sales professionals. Read an excerpt of the book here. Grab your copy of the SlideShare.